The perfect combination for renewal and rejuvenation! $135 // 2 hour treatment includes 1 hour massage and 1 hour facial. $165 // 2.5 hour treatment includes 90 minute massage and 1 hour facial. Relax tense muscles, ease sore spots, and improve circulation and mobility with a therapeutic massage. 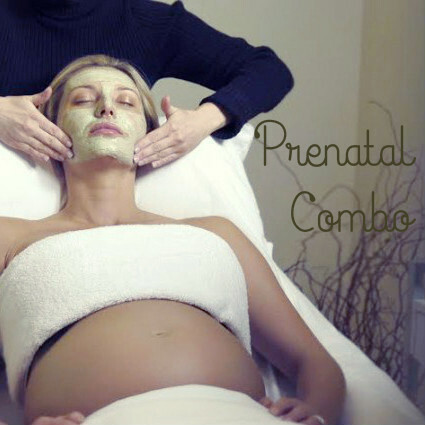 This service is performed with extra care and understanding for the changing body of Mom. A doctor's note is required for those in their first trimester. "Carrying a baby inside you changes your center of gravity and puts a lot of stress on your back, neck, abdominal muscles, and shoulders. Pregnancy also relaxes your ligaments, so that your pelvic joints are less stable, and changes your posture, pulling your pelvis forward. Add to that the extra weight you're carrying and you may find you've got an aching lower back." The facial penetrates pores to dissolve impactions and blackheads, kill bacteria, reduce inflammation and remove excess cell debris. The three step Oxygenating Trio® will prevent free radical damage as oxidative and environmental stress contribute to the aging process. Safe for pregnant and lactating women and all skin types.